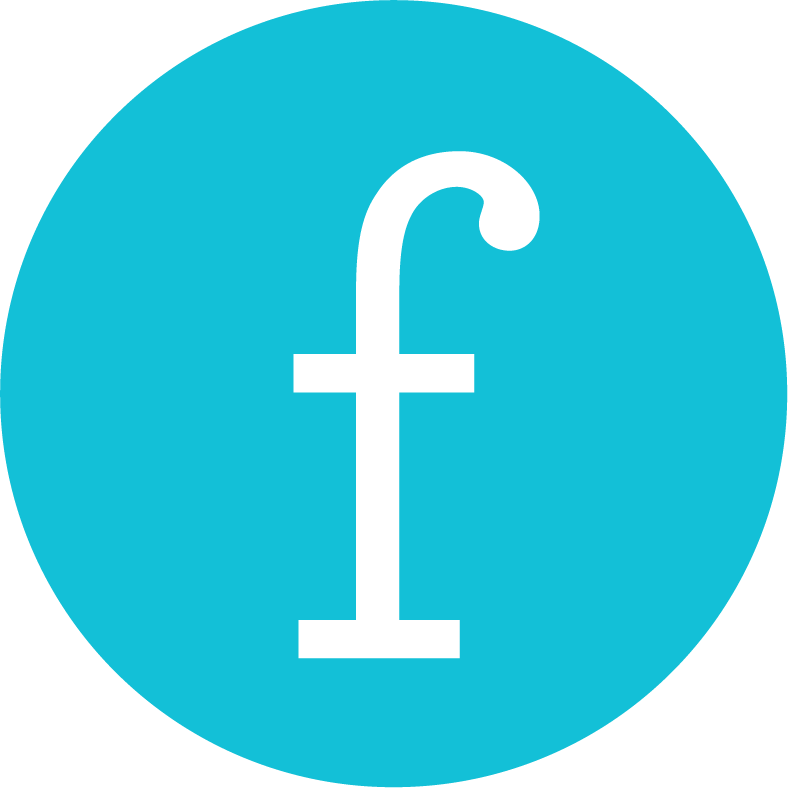 The thriving team of designers, engineers, and thinkers at Lunar issued a challenge: Bring delight to our clients for the holidays—and make it really fun. 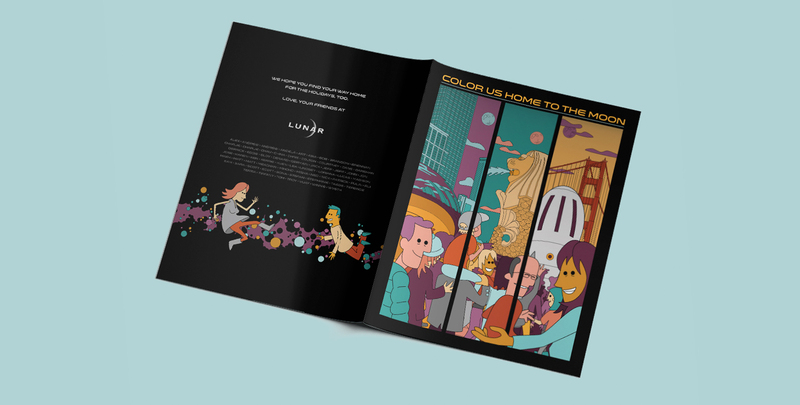 We collaborated with the Lunar team to ideate an activity book with a story woven through: Lunarites head home to the moon for the holidays. And, boy, what fun they have! 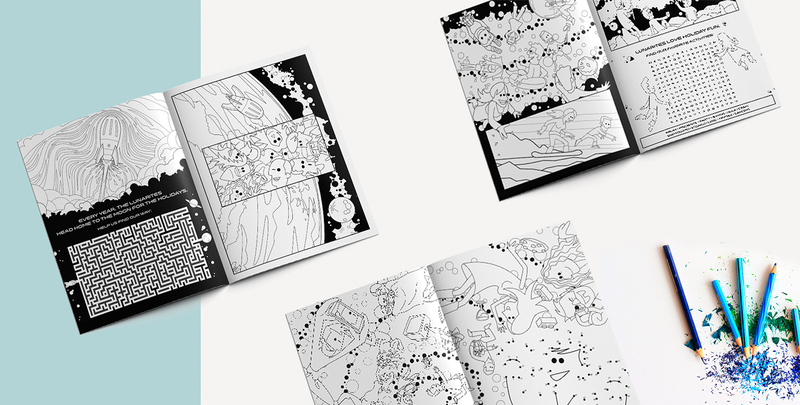 Our first course of action: create a style simple enough for a colouring book and yet unique enough to bring the Lunarites to life in an engaging way. It was integral to the Lunar team, who are a team-first organization (they eat lunch at a big communal table and are basically like one big family if we ever did meet one!). So we interviewed the Lunar team to find out what they actually love to do over the holidays, and then we moon-ized those activities for kicks. For instance, one Lunarite loved to go fishing with his family; in the activity books, he’s fishing for stars. Another loves to snow board; she’s hover boarding moon-style. Every Lunarite is in the book doing what they actually do over the holidays. We added in activities like a maze, connect the dots, and a word search for good measure. And Lunar mailed the books in time for the holidays with a set of colouring pencils to boot.